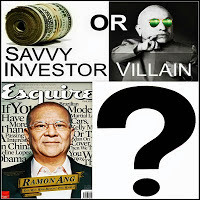 The EQualizer Post: Hey,Ramon S. Ang : "Honesty is a very expensive gift!" 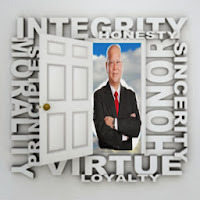 Hey,Ramon S. Ang : "Honesty is a very expensive gift!" Cojuangco and Ang have been on an incredible international buying and shopping spree. It's one for Ripley's "Believe It or Not!" What are the strategic reasons for this approach? Ramon Ang, president of San Miguel Corp. (SMC), greets visitors to his eighth-floor Manila conference room wearing a plain black suit, white shirt, red tie and $200 Seiko titanium watch. 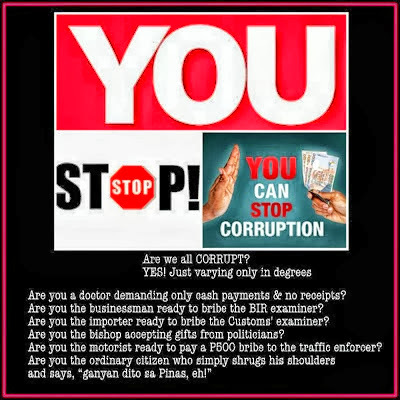 A billionaire who has diversified the 121-year-old brewer into the Philippines’ largest publicly traded company by revenue, Ang can afford a flashier timepiece. Yet the Seiko serves a purpose, Bloomberg Markets magazine reports in its December issue. Ang says he has a dozen of them so he can give away the one on his wrist. Ang, 57, has always found ways to make an impression -- and a profit. At age 13, he was repairing Japanese auto engines and selling them for a 150 percent markup. He won the trust of San Miguel Chairman Eduardo “Danding” Cojuangco Jr. after meeting Cojuangco’s son, Mark, in Manila’s auto-racing circles in the early 1980s. Today, Ang owns more than 100 cars in one of Asia’s best collections. His favorite: a 1964 two-door roadster called an AC Cobra 289 FIA made by AC Cars that was restored by American race-car specialist Carroll Shelby. “It’s the fastest muscle car,” says Ang, adding that the Cobra was once inexpensive as he jots down his top 10 list. Ang is on a similar tear with his buy-and-improve approach at San Miguel, as Philippine President Benigno Aquino primes the country for growth. Aquino, whose father was assassinated in 1983 after opposing dictator Ferdinand Marcos, wants to expand the economy as much as 8 percent annually. Gross domestic product surged 7.6 percent in 2010, the fastest pace since at least 1999. San Miguel, which reported revenue equivalent to 5.4 percent of the Philippines’ GDP in 2010, is key to meeting Aquino’s target. The company has already spent more than $4.8 billion on 24 acquisitions since the beginning of 2007, according to data compiled by Bloomberg. San Miguel bought control of the nation’s top oil refiner, Petron Corp. (PCOR), from Ashmore Group Plc (ASHM), a London-based fund manager. 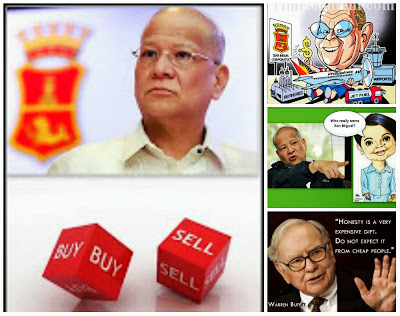 In 2008, it took a 27 percent stake in Manila Electric Co. (MER), the nation’s biggest power retailer. Last year, it paid $40 million for 10.1 percent of Australia’s Indophil Resources NL (IRN), which owns a 37.5 percent stake in the Tampakan project, one of the largest known untapped gold and copper deposits in the world. Ang also added three coal-mining companies. The mining foray bodes especially well for the country, says Mark Mobius, who oversees about $50 billion as executive chairman of Franklin Templeton Investments’ Emerging Markets Group. Ang has had run-ins with authorities during the pedal-to- the-metal expansion. The Philippine Stock Exchange dropped San Miguel from its benchmark index in November 2010, saying the firm wasn’t meeting the requirement of publicly trading more than 10 percent of its shares. San Miguel returned to the main index on Sept. 12 after it sold stock and convertible bonds. It has a 4.3 percent weighting. The shares, which have more than doubled in price since Ang became president in March 2002, traded at 112 pesos on Nov. 2 after peaking at 185 pesos on Jan. 3. The exchange has also questioned San Miguel’s public releases. Officials wrote to the company 32 times in the first nine months of this year, asking it to clarify information about acquisitions and other matters published in the media. Philippine Long Distance Telephone Co., the nation’s biggest company by market capitalization and a San Miguel rival, received six inquiries in the same time. The stock exchange didn’t impose any penalties on San Miguel during the period. It requires listed companies to disclose information to the exchange before releasing it to the media or to disclose the information simultaneously to the public. San Miguel’s change in corporate ownership may further cloud investors’ ability to assess the company, says Christopher Leahy, a member of the secretariat of the Hong Kong-based Asian Corporate Governance Association, which represents investors who manage about $12 trillion of assets. Last year, San Miguel agreed to be taken over by Top Frontier Investment Holdings Inc., where Ang is chairman. The Philippines-based holding company is controlled by San Miguel directors, including Roberto Ongpin and Inigo Zobel. Both have ties to the Marcos era: Ongpin was the dictator’s trade minister from 1979 to 1986; Zobel’s father sold his family’s San Miguel stake to Eduardo Cojuangco in the 1980s. In last year’s deal, San Miguel bought 49 percent of Top Frontier. As of March 31, Top Frontier owned 67.2 percent of San Miguel common shares, according to the company’s share sale prospectus in April. Ang says cross-ownership ensures San Miguel’s businesses and strategic undertakings continue according to management’s plan. In 1986, the government of President Corazon Aquino, the current president’s mother, took control of the company as part of an effort to recover the assets of Marcos and his associates. For Leahy, San Miguel’s limited transparency points up a larger concern: The Philippines has the worst governance scores among 11 Asian nations, according to a September 2010 report called “CG Watch 2010” by his association and Hong Kong-based brokerage CLSA Asia-Pacific Markets. “The issues of governance break down in the Philippines sometimes,” Leahy says. 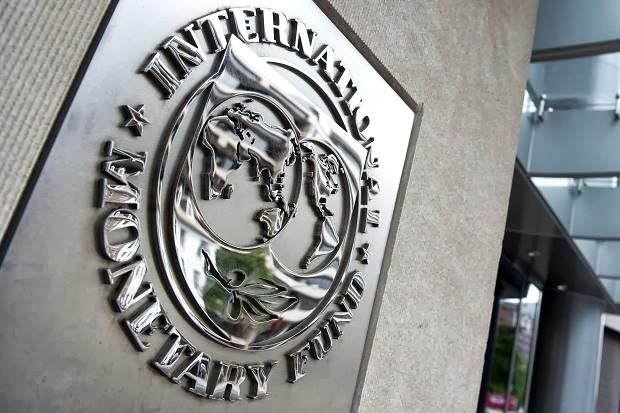 Many securities laws in the Philippines lag behind international and regional best practices, according to the report. For instance, under the Philippine Securities and Exchange Commission’s revised corporate governance code, companies are required to appoint two independent directors, or a number that represents at least 20 percent of their board. Most Asian countries require three independent directors, or a number that represents a third of their board. 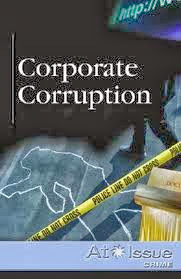 “Regulators and companies seem unaware of the problem,” the report says. Ang says San Miguel complies with the regulations of his country’s stock exchange and securities and exchange commission. “We always follow the rules,” he says. San Miguel’s 2010 annual report states the firm’s view: “The company recognizes that the most cogent proof of good corporate governance is that which is visible to the eyes of its investors,” it says. Standard & Poor’s has had its own beefs with San Miguel. It downgraded the firm’s debt-rating outlook to negative from stable in May. The rating company said San Miguel underestimated debt by not adequately reflecting the financial lease payments of its new power business, SMC Global Power Holdings Corp. San Miguel also counted some preferred shares as equity, rather than debt, S&P said. Ang is so concerned that competitors may be spying that he distributes new mobile phones and SIM cards to top deputies when he starts a project. To prevent leaks, they change the cards, which provide user information, every month and discard them and the phones when work on the project ends. Ang grew up far from the intrigue of high finance. The son of parents who worked in the auto parts business, he started his engine-repair venture and taught himself how to create value from inexpensive things. In high school, he took $250 from reselling engines to buy a used 1967 Pontiac Firebird. The deal cemented his love affair with sports cars and speed. Ang pursued mechanical engineering at Far Eastern University in Manila, graduating in 1982. The 1980s were emerging as one of the most turbulent eras in the Philippines’ stormy history. 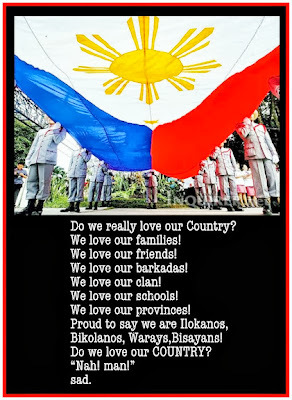 The country, stifled by Marcos’s declaration of martial law in 1972, was on the brink of revolt against the dictator, who counted the elder Cojuangco as his friend. After opposition leader Aquino was murdered, the military backed a popular uprising in 1986. Marcos fled to Hawaii with the Cojuangcos and other allies. He died in Honolulu three years later. The Cojuangcos spent a few months in Hawaii and then moved to California. Eduardo Cojuangco returned to the Philippines in 1989, resuming San Miguel’s chairmanship in 1998. He rewarded Ang, who had kept an eye on his interests during the family’s exile, by naming him vice chairman in 1999 and president and chief operating officer in 2002. With his patron back in charge, Ang set out to diversify San Miguel beyond its position as the nation’s biggest food and drinks company. The board at first was reluctant, Ang says. Directors changed their minds after he generated about $3 billion in cash by selling stakes in National Foods Ltd., Coca-Cola Bottlers Philippines Inc. and other firms he had bought while vice chairman. Ang pushed into mining, oil refining, power, infrastructure and telecommunications as President Gloria Arroyo began deregulating some industries. The timing was propitious. Companies were holding on to cash, and bank lending was scarce amid the global credit crunch. San Miguel snapped up bargains. 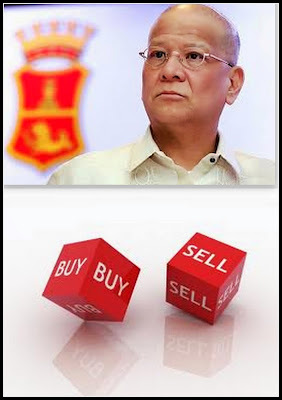 It financed purchases with the pile of money Ang had raised by selling stakes in units, including a $1.5 billion sale of 48.3 percent of San Miguel Brewery Inc. (SMB) to Japan’s Kirin Holdings Co. in 2009. Ang’s acquisition spree more than tripled San Miguel’s revenue to 474.6 billion pesos ($10.8 billion) in 2010 from 2007, based on consolidated figures reflecting acquired firms. Profit almost quadrupled to 31.5 billion pesos last year. Ang is raising his profile as the public face of San Miguel -- surpassing even the boss’s son. Seated in his conference room with a view of tropical gardens, Ang says he never imagined he’d be where he is today. “We were just simple people,” he says. Yet he always had high aspirations, naming India’s Mukesh Ambani as his role model. Ambani’s Reliance Industries Ltd. operates the world’s largest refinery complex, and Ambani owns one of the planet’s most expensive houses. “I admire his audacious expansion,” Ang says. His own expansion has a way to go, Ang says. 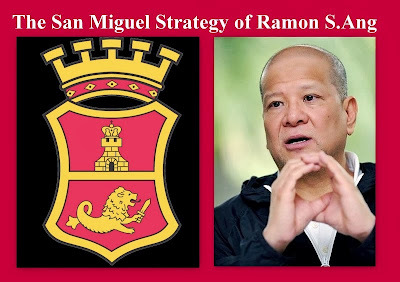 San Miguel exceeded his revenue target of $10 billion last year, based on pro forma results from the company. He’s aiming to double revenue again -- to $20 billion by 2015. He also wants to more than double Ebitda to $5 billion in the same period. Besides finding his next deal, Ang says his dream is to buy a 1954 Mercedes-Benz 300 SLR. Of the nine built, only eight still exist, including two in international museums. The remaining six are all owned by Mercedes-Benz, and none is for sale, according to Daimler AG, which makes Mercedes-Benz cars. In 1955, 82 spectators and 300 SLR driver Pierre Levegh were killed in Le Mans, France, in motor racing’s most catastrophic accident. “This car was too fast, too advanced for its time,” Ang says. Ang, who can’t get speed off his mind, says he sometimes pushes one of his Porsches or Ferraris to 200 miles (322 kilometers) an hour. As Ang steers San Miguel on its fast-track expansion, investors are hoping the company will show that it values transparency as much as crossing the finish line first. "Honesty is a very expensive gift!"